Cranberries are not just for stringing with popcorn to hang on the Christmas tree. Known for their pleasing, pucker-inducing tartness and ability to enhance a wide range of dishes, cranberries are popular in everything. They’re great as a trail mix addition or alone as a snack. Cranberries can be frozen for several years. They usually reach their plump, firm, and red peak in October, just in time for holiday baking. That’s the time to buy these berries, spread them in a single layer on a baking sheet, freeze them until solid, and then pop them in a freezer bag. That way, you can enjoy cranberry salad in July as easily as the winter months. Antioxidants and phytonutrients in cranberries, such as oligomeric proanthocyanidins, anthocyanidin flavonoids (which give them their bright red color), cyanidin, peonidin, and quercetin, have unique health-impacting attributes. (Scientists say it’s possible that the anthocyanidin strength in cranberries is increased when they’re water-harvested, due to the amount of natural sunlight they’re exposed to.) Some contain stroke- and cardiovascular disease-preventing compounds that discourage cholesterol from forming in the heart and blood vessels. Fresh cranberries contain the most antioxidants; dried run a close second, but bottled cranberry juice contain the least. Make sure when buying juice or juice cocktails that it’s 100% juice and not a “drink” which often (always) includes added sugar. Numerous studies demonstrate the range of potential health benefits provided by cranberries. One study listed several illnesses they can protect against, including some cancers, due to inhibited growth and proliferation of tumor cells, its ability to induce the death of some cancer cells and the development, proliferation and movement of others. A review of the research on cranberries noted its effectiveness as a chemopreventive after several studies showed inhibited growth and spread of several types of tumors, including those in the breast, colon, prostate, and lung, possibly due to the flavonols and anthocyanin glycosides in the fruit. Researchers concluded that continuing studies would likely result in additional health benefits from cranberries. Regarding the use of cranberry extracts on lower urinary tract infections, one study reported that UTIs are so common, 60% of women suffer from it at some point in their lives. Caused by microorganisms, including E. coli, these infections are usually treated with antibiotics. But one study determined that one to 1½ cups of cranberry juice or cranberry juice cocktail per day can prevent 50% of UTI occurrences and reduce harmful bacteria, and twice-daily dosages of cranberries (36 mg) might offer additional protection during a 24-hour period. Traditional in the sense of the time of year they’re usually available in stores, which is mid-autumn, cranberries are one of those plant-based foods with as many health benefits as there are ways to prepare it. But in the end, each little red berry is worth its weight in nutritional attributes that can benefit nearly every area of the body. 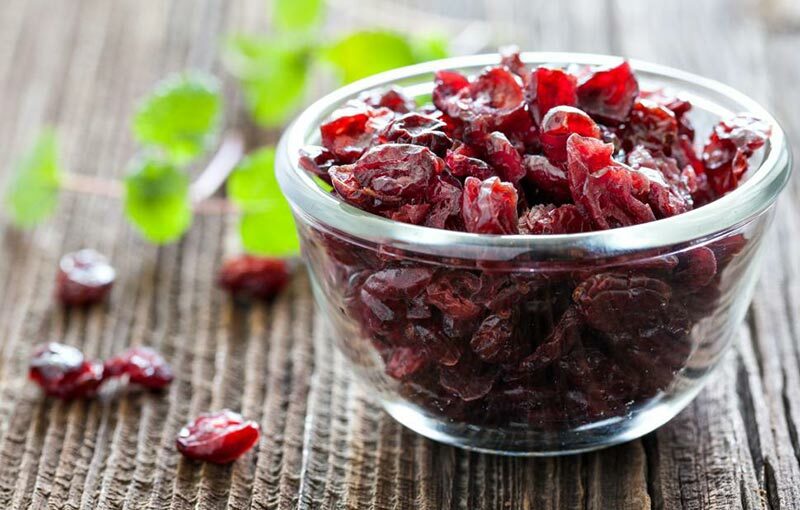 Scientists already know of cranberry’s ability to prevent heart disease, ulcers, urinary tract infections, and cancer, not to mention the ongoing advantages from the many vitamins, minerals, antioxidants, and phytonutrients it contains, such as anthocyanidins, cyanidin, peonidin, and quercetin. So remember, whenever you add cranberries to your table, you’re getting a double dose of goodness.